This page will mark a change of style, because the October 2003 visit was my first one with a digital camera. Use of digital cameras since then has made absolutely to my lack of ability as a photographer! What it has done is to make my 'just for the record' photos much more plentiful, so to avoid the restrictions of flowing text round multiple images I've grouped each day's photos below that day's text. So, if you're wondering why things look different - that's why! Despite the wretchedly hot weather that we’d experienced in June my gricing associate and I had taken quite a liking to the Czech way of doing things, and while we were there he’d picked up a leaflet suggesting that there was a worthwhile steam event in October at the museum at Lužná u Rakovníka, with associated steam specials to and from Prague. A suitably inebriated discussion was held at the Eagle and Child, featuring the leaflet and timetable, and it was agreed that there was all this track in North Bohemia that needed doing, and why didn’t we go to Lužná while we were about it. So we did. After a massive quiz victory (OK, 5 points) we left home in reasonably good heart for the 0730 CSA flight to Praha. All went smoothly (impressed by BHX’s breakfast bap with decent bacon and sausage) and CSA’s 737-500 pushed back at 0733. Touched down at Ruzyne at 1030 o.n.o. and after a luggage delay we escaped at 1110 for the 100 bus to Zličin, thence line B to Náměstí Republiky for a visit to Praha Masarykovo where we failed to book a seat on tomorrow’s kettlex to Lužná u Rakovníka. Onwards therefore, to U Fleků for a ham salad and a couple of beers (not to mention a strenuous, and successful, debate regarding the Becherovka scam). Second venue was the New Town Brewery where after much rambling round the cellars we eventually found a table and enjoyed a litre of the home brew. Back at Praha Masarykovo we failed again on the reservations, this time assured it wasn’t possible, so we decided to bunk it and pay on the day. 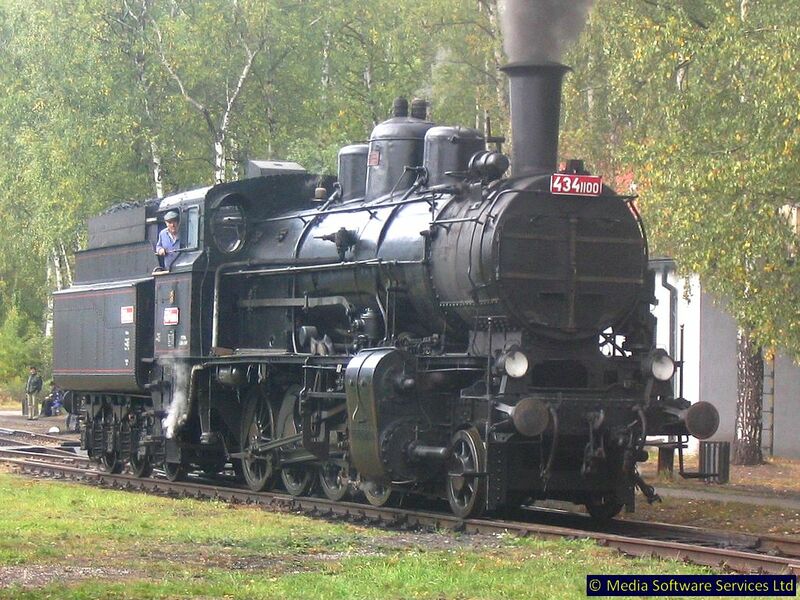 1445 or thereabouts to Kralupy was an EMU and then onwards to Velvary in a wheelie bin (809 though, by way of a change). Ticket purchasing at Velvary, seemingly always the end of the branch, required an extended lecture in Czech by the very helpful station person, but was eventually successful after establishing that Louny is pronounced Loany. Back to Kralupy on the wheelie bin with a brief visit to the station buff for Krušovice, then to Louny via Zlonice on a bogie railcar with two trailers. The bus connection was very much ‘not as web site’ but it turned up nonetheless and CZK5 got us a scenic ramble round the (very dreary) suburbs of Louny before depositing us at Tyršovo náměstí, 5 minutes or so walk from the hotel. No restaurant due to a ‘cosmeticians’ (or was it morticians? I think we should be told) convention and all the pubs were booked solid but we eventually found one to provide a steak washed down with Krušovice. Alone and unarmed, one Eurogricer was no match for the mozzies of Louny. [I was overrun with the things. PR’s room apparently had none!] A bad night was had… Arrived at reception at 0510 to find it in Fort Knox mode with a steel shutter blocking the exit. After much searching for another way out, a receptionist appeared and let us (PR had also materialised by this time from his mozzie-free quarters) out. The bus appeared on time at 0535 and a fleet of wheelie bins awaited at Louny station. 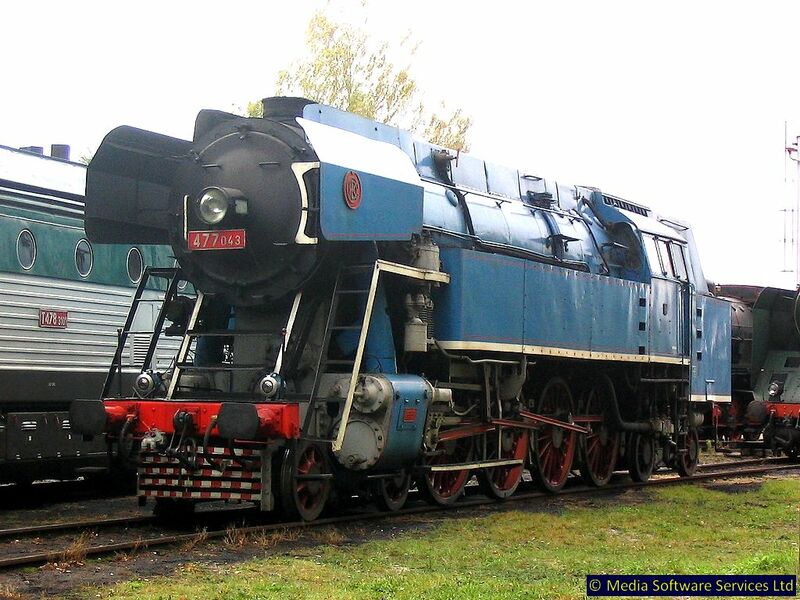 Ours was 810420 forming the 0550 to Kralupy nad Vltavou. On arrival at Kralupy an odd assortment of workings (loco + wheelie bin trailer, wheelie bin and wagon, freight with 2 x 742 fore and 2 x 753 aft, were seen before we set off to Praha Mas on an EMU. 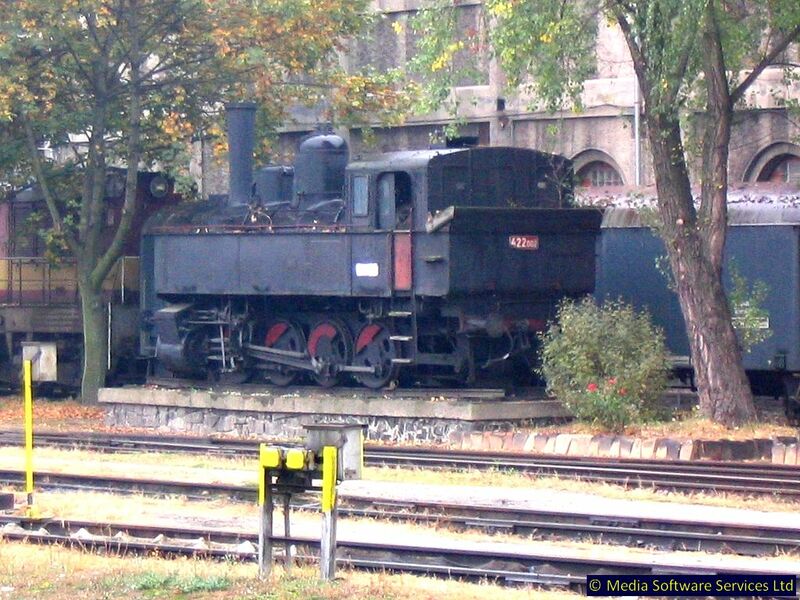 The stock for the kettlex (ancient wooden seat 4-wheel vehicles) appeared behind an electric with 434 2186 already attached. It turned out that no reservation was needed in the end. Our rovers were valid for travel too, so all very economical despite our strenuous efforts to pay! Breakfast was procured at Praha Mas., and very welcome it was too. The 434 was worked hard all the way but didn’t quite manage the schedule – still an entertaining run albeit bouncy in four wheel coaches. Major event going on at Lužná but as we were late the branch train to Kolesovice, with 434 1100 tender first, was ready to go. We were chinged this time, for a whole CZK 60. Back at Lužná we had a wander round the museum which given its constraints on money, was very good. Several kettles in steam and a reasonable attendance. 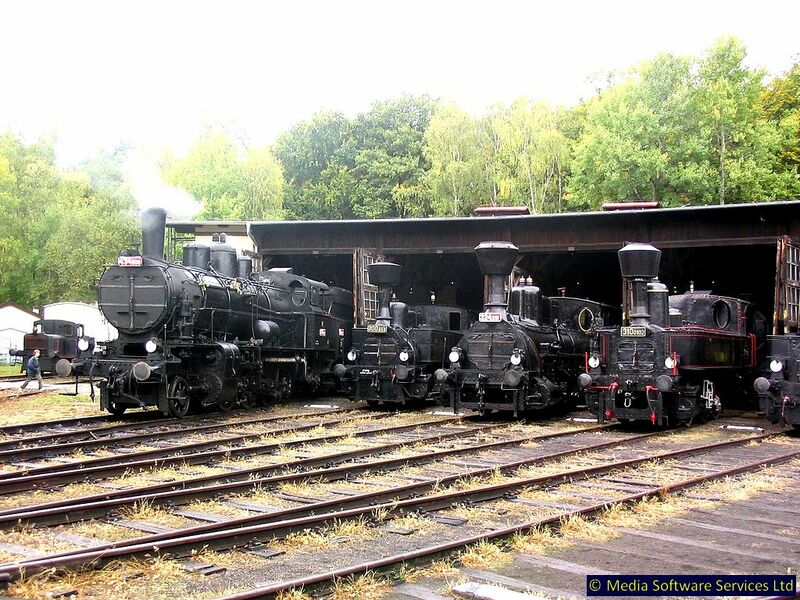 We retired across the road for a couple of Bernards before the 1428 to Rakovník which was 714028 and three trailers. Being late at Rakovník, there was only time for a mad dash to wheelie bin 810488 for a ride up to Louny and back prior to the ‘curve bash’ 1759 Rakovník - Most. A very pleasant run on a sunny afternoon, aided by a bottle of Kozel. On the return trip there’s a 17 minute pathing stop at Svojetín which allows of some fresh air. 810043 was wheelie bin of the moment; it arrived at Rakovník on time, as did 714214 with three trailers, forming 1759 to Most. Hopefully via the Louny avoider. It was not to be. Straight to Louny střed where PR and I decamped to go for an excellent meal in a Louny pub, and thence back to the hotel for a bit of on the spot mozzie-slaughtering. Missed one unfortunately and got stung for my pains, but 10 hours sleep still made all the difference (not to mention a proper breakfast). All went well on the 1024 wheelie bin from Louny město until the first stop at Březno u Postoloprty where it was all out on to the SEV. So that was another side of another triangle gone… 810459 was waiting at Postoloprty and left on time for Žatec (Západ hopefully). A half hour break at Chomutov was occupied with a bottle of Louny. 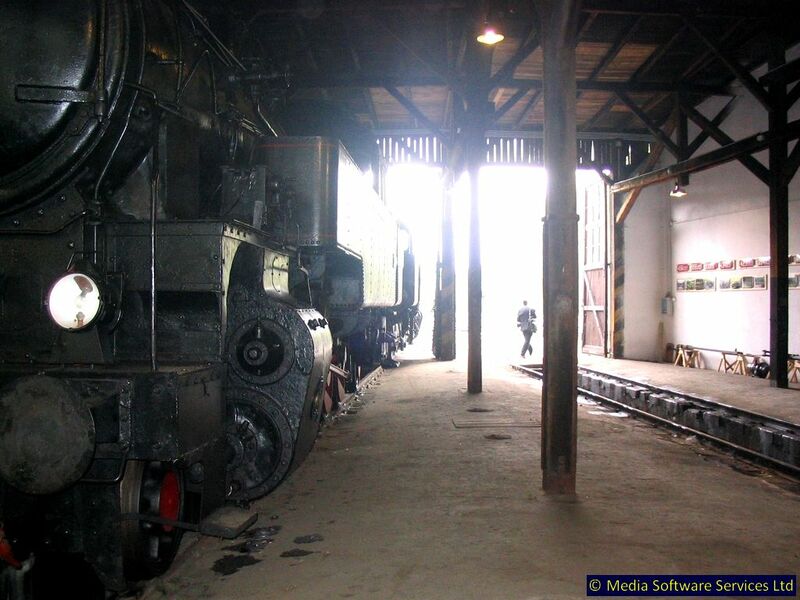 Major changes at the Chomutov station buff – one of the tables had been turned through 90° since our last visit in 10/2001! We proceeded to Kadaň on 810310 for a very quick connection on to 810316 for Kadaňský Rohozec. The ČD magazine on this train showed the construction of a new line at Pardubice diverging north eastwards from the Chrudim - Hradec Králové line just north of Mikulovice and running north east for a short distance before turning sharply west to join the existing east-west main line. 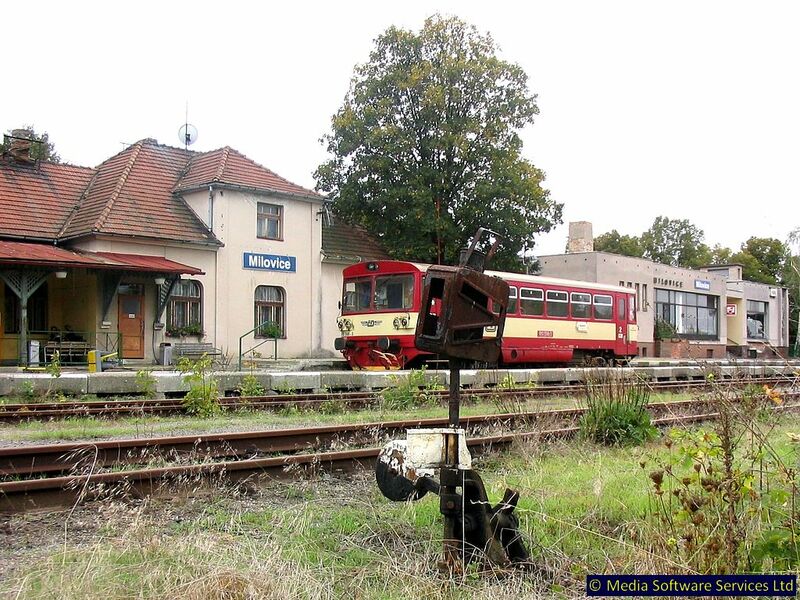 This will presumably avoid the propelling moves needed to get Chrudim trains to and from Pardubice hl.n. [or would - but in 2018 there's still no sign of it being built]. The layout at Kaštice is odd, with the line turning through 120° to join the Žatec line heading north. The trains then reverse to run a short distance south into Kaštice station. Quail suggests there was a west to south curve but we didn’t see any sign of it. The (2 minute) connection on to Podbořany was 810676 with trailer. Podbořany has a conveniently placed, modernised/minimalised pub across the road so we ventured in for a couple of Gambrinuses while awaiting the 1620 to Chomutov which may or may not do the Žatec west curve. At least it’s proper stock hauled by 754028. And it did do the Žatec west curve! I love it when a plan doesn’t fall apart. Onwards then over familiar ground to Chomutov, where the connection to Most (a Liberec train hauled by 163078) was being held. This was totally wedged and an interesting altercation occurred between the gripper and a student who wouldn’t move his rucksack. The gripper gave up, but when I dived into the half empty seat the student moved his bag… This little excitement over, we transferred to 810314 at Most for a journey through impressively squalid surroundings to Louka, whence 810667 took us to Litvínov. Litvínov is the first place for many, many years where I’ve been able to taste the atmosphere and ten minutes there was 8 minutes too long. 810667 again to Oldřichov, again not a beauty spot, thence 163077 and proper coaches to Teplice where the daylight pegged out. With half an hour to spare we pottered down the road to a small kiddiepub with Staropramen and a delightful barmaid! 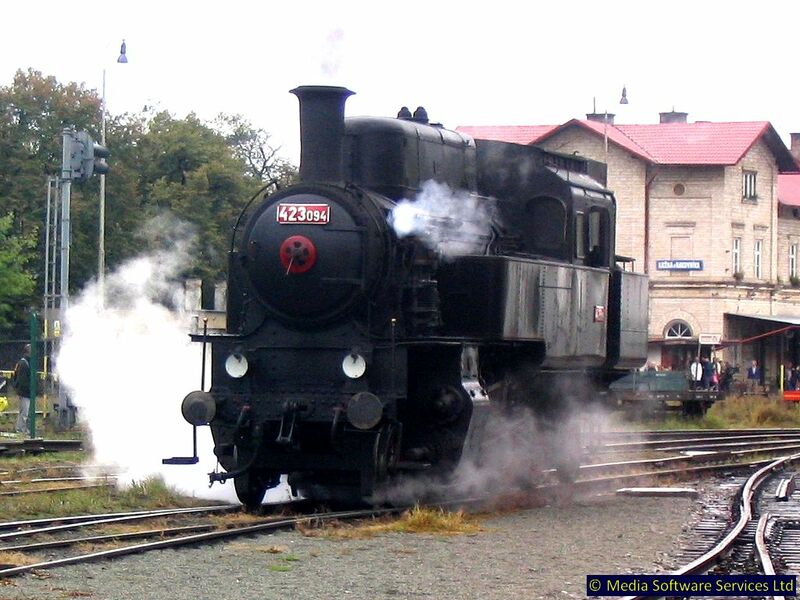 Return to Louny was on the 1920, back to reality with 810420. Dead on time arrival at 2033 and the 2040 bus dropped us off at Ulice Žižkova for dinner at the hotel. Despite another late night cull, found 3 more mozzies at 0630, accounting for the extra bites… Off to Louny Město for another attempt at Březno – Postoloprty which was supposed to be reopened. It wasn’t, and an even more decrepit SEV than yesterday’s obliged. 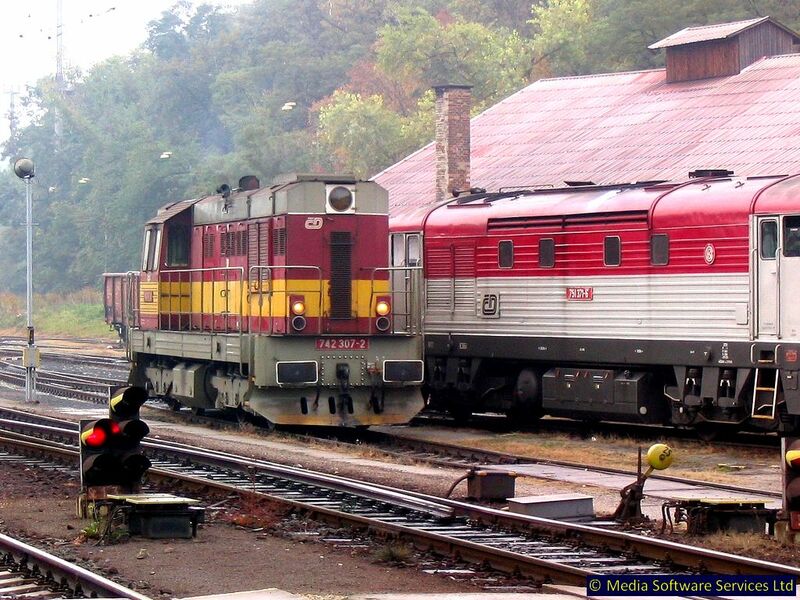 810107 and 810459 did Louny to Březno and Postoloprty onwards, respectively. 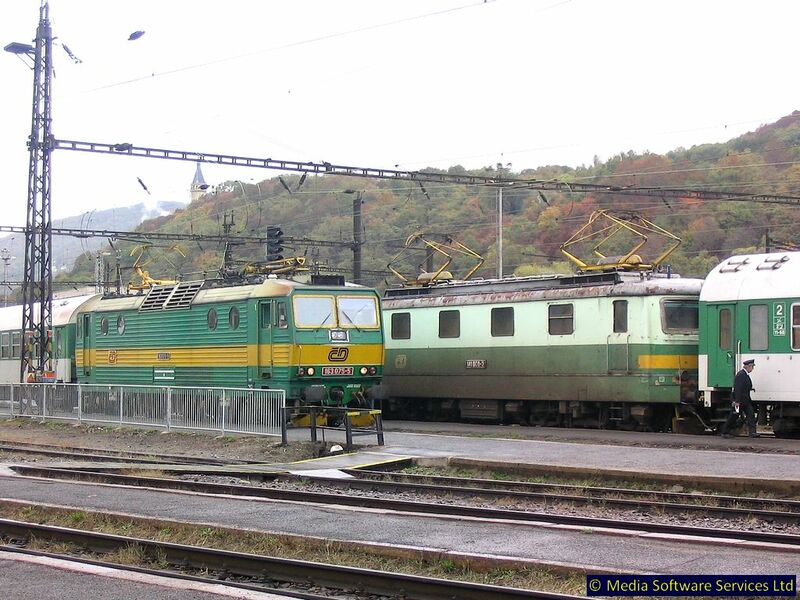 Luxury travel on from Žatec with 843004 and two trailers. Looking again at the new line east of Březno u Chomutova it appears to go through a tunnel under a low ridge soon after leaving the present alignment. [It does. See earlier remarks – Ed!] 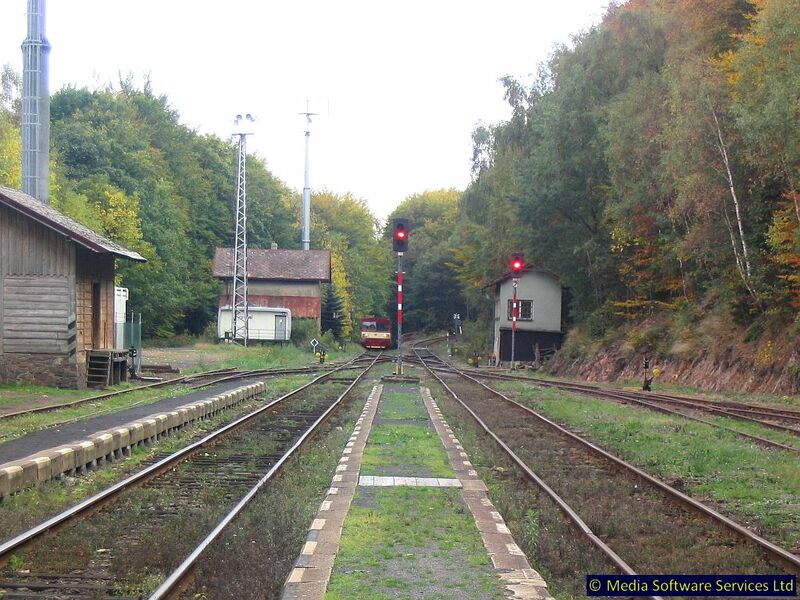 Single line working prevailed on the main line just west of Chomutov due to replacement of a crossover, which was causing some delays. 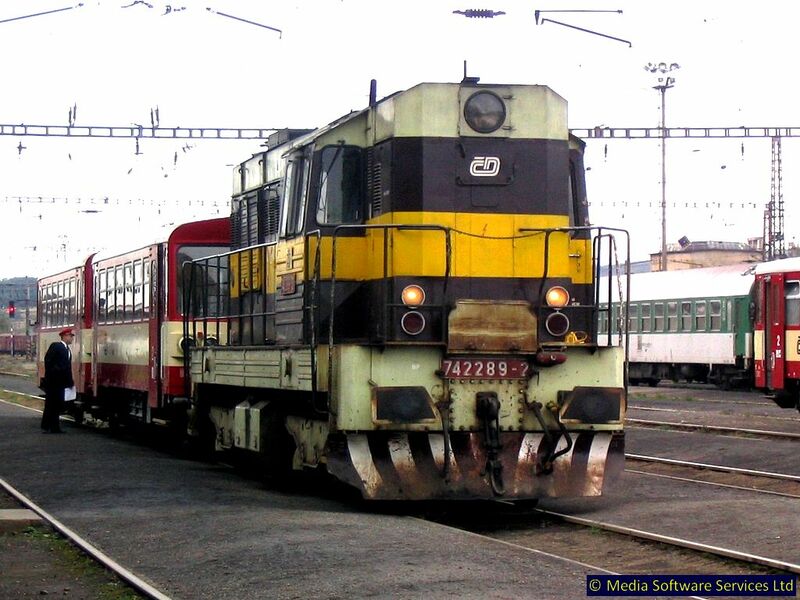 The 843 had to wait for our Kadaň-Jirkov train which consisted of 810337 and a trailer which it left at Chomutov. The Jirkov branch demonstrates quite a lot of commitment! After leaving the main line just before Jirkov zastávka station it passes through an area of commercial development. This is served by new roads requiring two expensive bridges over the branch. There is a large trolley bus depot adjacent to the start of the branch and with the main line in sight almost throughout, one would have thought a trolley bus link to Jirkov zastávka would have been far more economical. Back at Chomutov the 0947 to Bílina and Ústí comprised EMU 460086, whose schedule was incredibly leisurely. At Bílina it was a cross platform (yes there was one) connection to 810589 for ‘half a branch line’ to Úpoříny. The junction east of Bílina appeared possibly to be a diveunder for westbound trains… [it is. I got to do it eventually]. 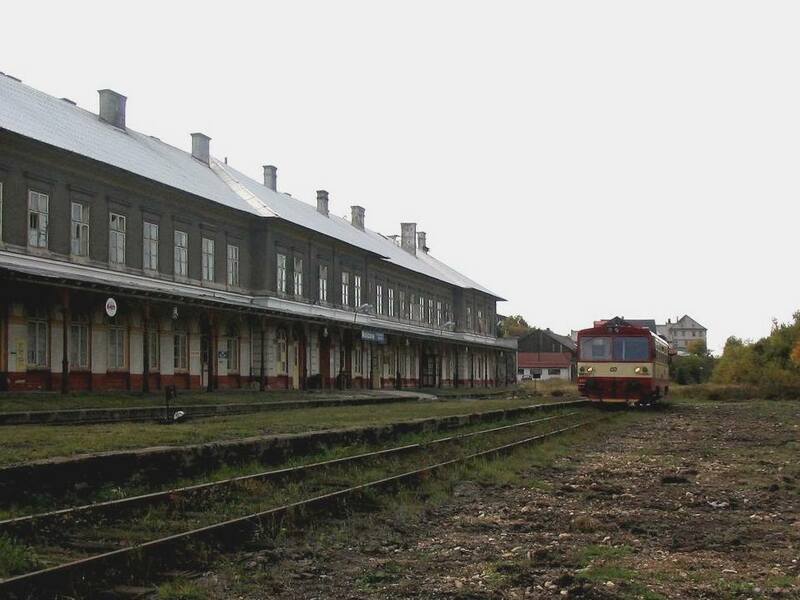 At Úpoříny both trains (from Bílina and to Lovosice) went right across the layout to opposite sides – in on the southernmost side and out on the northernmost. The line to Lovosice was a surprise – serious ‘up and over’ with some spectacular views higher up. Well worth an hour of anybody’s time. And so to the station buffet at Lovosice (there being nothing better to be had nearby) and two Gambrini, then back to Most via Čižkovice with 810238. One of several ridiculously located castles was photted at Třebenice, and all in all it’s quite a scenic line with all sorts of odd geology visible. At Most the station is something of a monument to old times. We paid our respects with a Budvar in the small upstairs buffet. As you do. Onwards and upwards then, on yet another wheelie bin, 810349, to Moldava. Once out of the industrial grot of Most and Litvínov this is a superb branch, climbing steeply from Osek all the way to the reversal point at Dubí. The climb is just as steep thereafter with two tunnels, the first preceded by a station with a ‘flashing’ garden gnome on the platform. Honest. Moldava itself has seen better days – all the freight and loco facilities are derelict but the huge station building [frontier between the Hapsburg and Hohenzollern empires, when you think of it, so pretty darned significant once!] contains a very pleasant bar with a lot of photographs of Moldava in its heyday. Between the wars it was a border station with half Czech and half German staff. The ride back down gives you a second chance at some really striking views southwards, with industrial grot hardly in evidence. Definitely a ‘must do’. 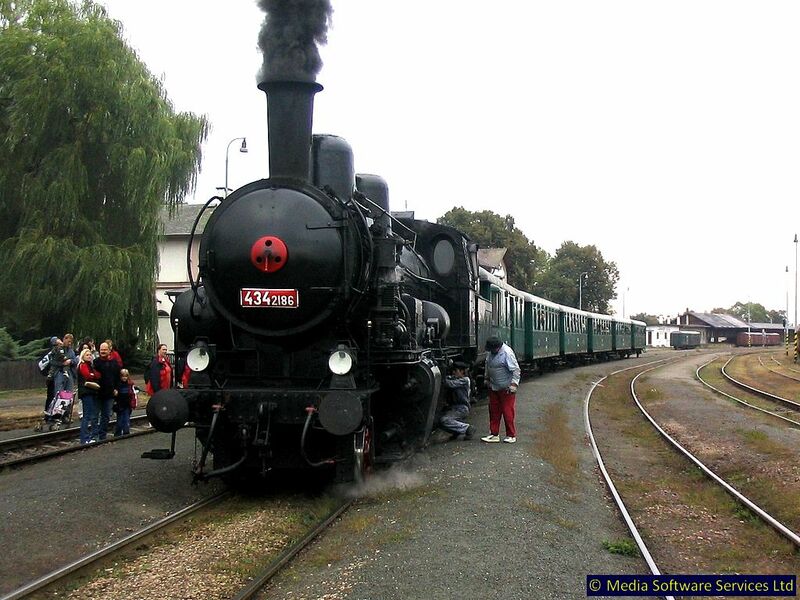 Return to Louny was in a failed 843 hauled by 714211, just for a bit of variety. Slightly delayed by waiting for single line sections, but in time for the 1835 bus to supper! Route (unfortunately) was via Bečov direct to Louny rather than by the east curve at Postoloprty. Today we finally realised, too late, that the engineering work was booked to finish on 5.11.03 and not 5.10.03… Consequently we got the SEV to Postoloprty yet again. 810043 took us to the bus, 810128 on from Postolprty to Most, finally achieving one side of the triangle! 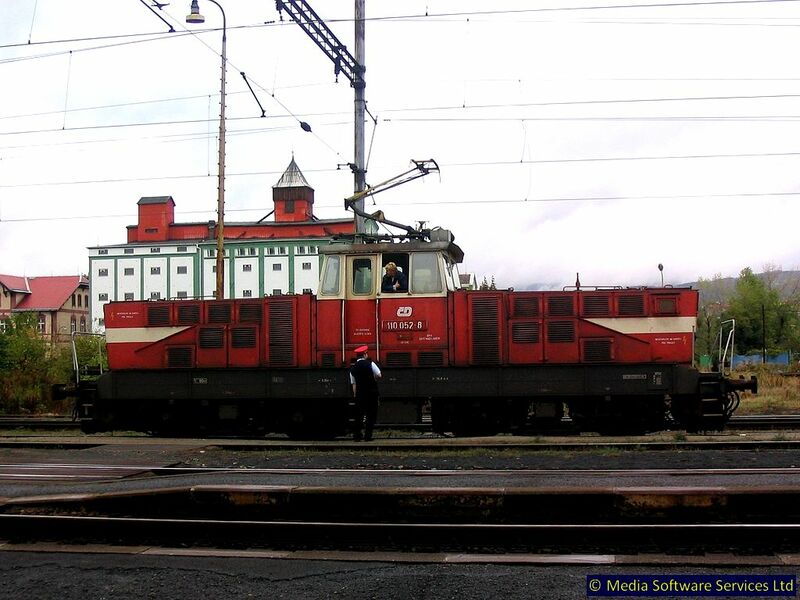 From Most a Kolín train with 163903 left dead on time, allowing just enough time to phot the diesel hauled freight which came in beside it. On arrival at Teplice we found ourselves with almost half an hour to wait. Only 1005 but nothing for it – into the buff for Březňák from Velké Březno. Standard Czech lager, I thought. 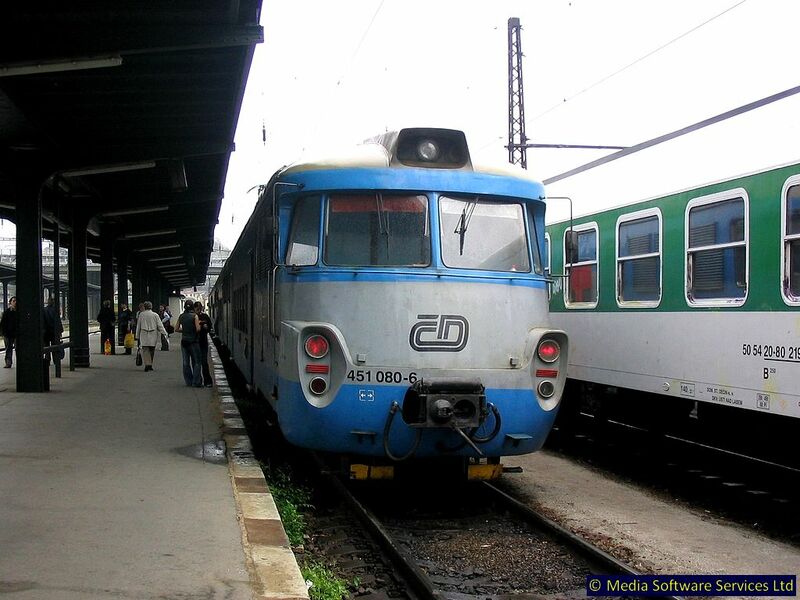 The next stage was a ‘fill in’ back to Úpoříny on 810238, with a rapid leap to 810334 from there to Ústí nad Labem hl.n. to complete the Bílina/ Řetenice/Ústí/Lovosice ‘cross’. Back from Ústí hl.n. to Ústí Západ on the return working, after a very quick 0.4l of Velvet and about 3 cwt of ‘Bear’s Paw’ in a nearby Staropramen establishment. This turned out to be one of a franchise chain in a ‘Good old traditional pub’ theme, and none the worse for that if expensive by Ústí standards. The haulage from Ústí nad Labem Západ to Lysá nad Labem was antique 141008 – the first few miles in the Vltava gorge are very impressive but thereafter, tedium is the watchword. 5 minutes late arrival at Lysá due to waiting connection at Všetaty just allowed enough time for a Gambo in the station buff (having failed to observe the Nymburk font early enough). 810598 was Wheelie Bin Of The Day to Milovice, a 6 minute run from Lysá. There seem to have been extensive freight facilities, possibly military [spot on - see en.wikipedia.org/wiki/Milovice_(Nymburk_District)], here at one time but only a large station, some disused sidings and an array of floodlights remain. Despite this, and the parallel road, the railbus was well patronised both ways. Return to Praha was direct from Lysá on a suburban EMU to Praha Masarykovo – these reverse somewhere in the neighbourhood of Praha Libeň, somewhat to our surprise. They reverse very rapidly, too! [but not now, following the extensive remodelling of the eastern approaches to Praha]. Back in Praha we managed a visit to the new(ish) monastery brewery near the castle, which did a very pleasant light beer in an undemanding modern brew pub, and another one to a four ale bar near U Fleků, before heading off to the airport for the 737 home. The 737 obliged by being 10 minutes early at BHX and we arrived at the same time as H who conveyed us back to darkest Telford. 2003's next (and final) short outing, with Mrs EG accompanying, featured both track and Christmas markets in Germany.